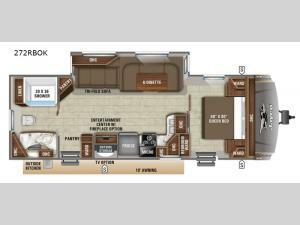 This single side out Jayco Eagle HT 272RBOK is the perfect travel trailer for a medium sized family who wants to get away to the great outdoors! It features plenty of seating and sleeping options between the tri-fold sofa, U-shaped dinette, and the front private bedroom with a walk-around queen bed, wardrobes on either side, and overhead cabinets, plus one of the double entry doors enters into this room. You are sure to love the added privacy of the rear bath, as well as, the linen closet, overhead cabinets, and spacious counter with a sink. Even when mother nature rains on your parade, you can enjoy the outdoors when you grab a chair and your favorite beverage and head underneath the 19' electric awning with LED lights!